Tidewater Virginia contains an array of streets, trails, walkways, boardwalks, beaches, woodlands, and other areas suitable for walking, running, biking, and other outdoor activities. The Eastern Shore is known for its rural trails, many in natural areas. Chincoteague National Wildlife Refuge and Assateague Island National Seashore contain miles of trails for hiking, biking, walking, running, and wildlife watching. One of the largest natural areas in Hampton Roads, Newport News Park contains approximately 30 miles of trails. In Hampton, the pathways of Fort Monroe National Monument lead to historical sites, beaches, and other attractions. For nature lovers, trails at Sandy Bottom Nature Park surround a scenic lake. In Norfolk, the Elizabeth River Trail is a popular urban pathway. In Oceanview, public parks include walking trails as well as beach access. Near Chesapeake Virginia, access for recreation is available along the Dismal Swamp Canal Trail and trails within Northwest River Park. The historic Virginia Beach boardwalk is popular with walkers, runners, and bikers. Nearby, First Landing State Park and Back Bay National Wildlife Refuge have several miles of trails. At York River State Park, outdoor enthusiasts can explore 16 trails covering approximately 20 miles. 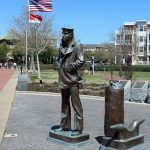 In Yorktown, Riverwalk Landing is one of Yorktown’s most popular areas for outdoor recreation. From downtown, the pedestrian riverwalk leads to one of the area’s most beautiful beaches.